Aneurysmal subarachnoid hemorrhage (SAH) is bleeding that occurs into the subarachnoid space when an aneurysm ruptures. While the morbidity and mortality from this event has been on a decline due to improved treatment approaches, the risk of vasospasm after subarachnoid hemorrhage continues to be the same as it was several years ago. The importance of establishing a comprehensive and reproducible animal model to identify initiating events of cerebral vasospasm has been the focus of research since the first use of rats in an experimental vasospasm model in 1979 by Barry et al. Early work in rats demonstrated that a single injection of autologous blood into the cisterna magna led to acute (within minutes) but not delayed cerebral vasospasm 3, 6, 14. Here we characterize a low mortality SAH rat model that results in reproducible delayed vasospasm. Dudhani, R. V., Kyle, M., Dedeo, C., Riordan, M., Deshaies, E. M. A Low Mortality Rat Model to Assess Delayed Cerebral Vasospasm After Experimental Subarachnoid Hemorrhage. J. Vis. Exp. (71), e4157, doi:10.3791/4157 (2013). Objective: To characterize and establish a reproducible model that demonstrates delayed cerebral vasospasm after aneurysmal subarachnoid hemorrhage (SAH) in rats, in order to identify the initiating events, pathophysiological changes and potential targets for treatment. Methods: Twenty-eight male Sprague-Dawley rats (250 - 300 g) were arbitrarily assigned to one of two groups - SAH or saline control. Rat subarachnoid hemorrhage in the SAH group (n=15) was induced by double injection of autologous blood, 48 hr apart, into the cisterna magna. Similarly, normal saline (n=13) was injected into the cisterna magna of the saline control group. Rats were sacrificed on day five after the second blood injection and the brains were preserved for histological analysis. The degree of vasospasm was measured using sections of the basilar artery, by measuring the internal luminal cross sectional area using NIH Image-J software. The significance was tested using Tukey/Kramer's statistical analysis. Results: After analysis of histological sections, basilar artery luminal cross sectional area were smaller in the SAH than in the saline group, consistent with cerebral vasospasm in the former group. In the SAH group, basilar artery internal area (.056 μm ± 3) were significantly smaller from vasospasm five days after the second blood injection (seven days after the initial blood injection), compared to the saline control group with internal area (.069 ± 3; p=0.004). There were no mortalities from cerebral vasospasm. Conclusion: The rat double SAH model induces a mild, survivable, basilar artery vasospasm that can be used to study the pathophysiological mechanisms of cerebral vasospasm in a small animal model. A low and acceptable mortality rate is a significant criterion to be satisfied for an ideal SAH animal model so that the mechanisms of vasospasm can be elucidated 7, 8. Further modifications of the model can be made to adjust for increased severity of vasospasm and neurological exams. The rat is anesthetized using 0.1 mg/kg of Ketamine/Xylazine rodent cocktail and allowed to sit for 5 min. Adequate anesthesia is confirmed by reduction in hind limb reflex. Using an electronic shaver a neck to nose area of hair around the sub-occipital region is shaved. The animal is placed supine on the surgery table and the tail is swabbed with betadine to ensure a sterile incision. The dissection is extended until the tail artery is identified and isolated. Using a sterile 26-gauge catheter, the tail artery is cannulated and 0.15 ml of arterial blood is withdrawn into a syringe. A sterile gauze is wrapped around the incision to ensure hemostasis before application of the vetbond to seal the incision. The rat is turned prone on the table and the shaved area over the sub-occipital region is swabbed with betadine. Using a vertical midline incision access is gained to the cisterna magna. Once identified a 25 gauge needle is inserted into the cisterna magna and 0.15 ml of CSF is withdrawn into a syringe to avoid increased intracranial pressures with injection of autologous blood volume. Now, the 0.15 ml of blood extracted from the tail artery is injected slowly into the cisterna magna. 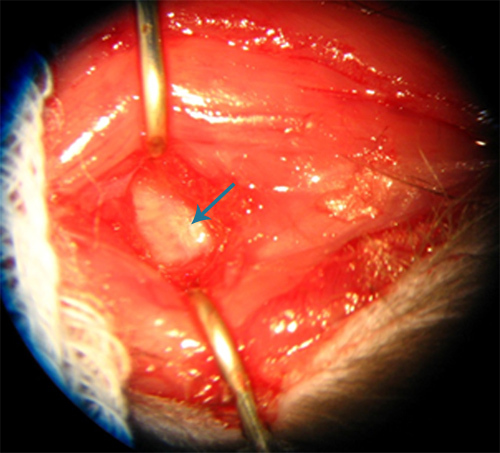 The needle is left in place for 30 sec to ensure clotting in the subarachnoid space and then carefully withdrawn. Hemostasis is ensured and the incision is closed using a stapling device. The animal is now placed prone on a warming surface with a 20 ° head down position for 20 min to allow blood to congeal in the cisterns around the basilar artery. Steps 1.1 to 1.15 are repeated during the second surgery 48 hr apart. The rat is turned prone on the table and the shaved area over the sub-occipital region is painted with betadine. Once identified a 25 gauge needle is inserted into the cisterna magna and 0.15 ml of CSF is withdrawn into a syringe and the sample is stored. Now, the 0.15 ml of normal saline (37 °C) is injected slowly into the cisterna magna. The needle is left in place for 30 sec and carefully withdrawn. The animal is now placed prone on a warming surface with a 20 ° head down position for 20 min. Steps 2.1 to 2.15 are repeated during the second surgery 48 hr apart. On day 5 after the second surgery, the rats are sacrificed by cardiac perfusion. With a vertical midline incision, the abdominal cavity is approached and the peritoneum is opened. An anterior thoracotomy is performed and the heart is exposed. Using a 26-gauge catheter connected to a phosphate buffer solution (PBS pH 7.4 and at 37 °) the animal is drained of blood and is then perfused with 4% paraformaldehyde. After ensuring adequate perfusion, the perfusion is stopped and the rat is brought over to the decapitation table. After decapitation, a bone rongeur is used to remove the cranium for brain removal. The brain and brainstem are carefully extracted from the cranial vault and placed into a 4% paraformaldehyde solution and stored at 4 °C for 48 hr. The rat brain that has now been submerged in 30% sucrose for 4 days is brought to the cryostat for sectioning. Once cryoprotected, 12 μM sections are created using the cryostat, with the Anterior Inferior Cerebellar artery (AICA) as the starting point to ensure inter-subject consistency. 20 sections are created for each animal, ending at the Superior Cerebellar artery (SCA). Within the protocols described above, there are several steps that we believe require a better characterization of the model than what has been previously described in the literature. Here we focus on the steps that are essential in order to achieve a reproducible low mortality cerebral vasospasm small animal model and avoid potential pitfalls associated with this model if not done correctly. Careful placement of the angiocatheter in the tail artery is the essential first step in the model. Figure-1 shows the placement of a 26 gauge catheter in the tail artery of the rat. This represents a good placement with minimal trauma and blood loss. Proper placement of the angiocatheter can be confirmed by good blood return. Deep dissection of the suboccipital region is performed until the atlanto-occipital membrane is visualized as a shiny white membrane (Figure-2). 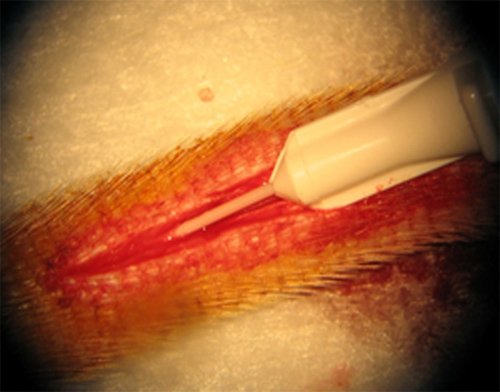 The cisterna magna is accessed via a puncture through the membrane with a 25-gauge needle. After withdrawal of the needle, pooling of blood should be noted, to ensure a sufficient volume of autologous blood stays within the subarachnoid space of the cisterna magna. Excessive pooling of blood on the outside aspect of the atlanto-occipital membrane is undesirable because our model uses relatively low volumes (0.15 ml) of autologous blood compared to existing models and pooling could result in ineffective volumes of blood in the subarachnoid space. Higher volumes of blood frequently resulted in respiratory failure presumably from elevated intracranial pressure and blood products shortly after injection. The collection of blood around arteries in the subarachnoid space is one of several possible methods to initiate experimental vasospasm 8. At the time of the second surgery, the atlanto-occipital membrane may occasionally be difficult to visualize, although the puncture site from the first surgery is often visible. 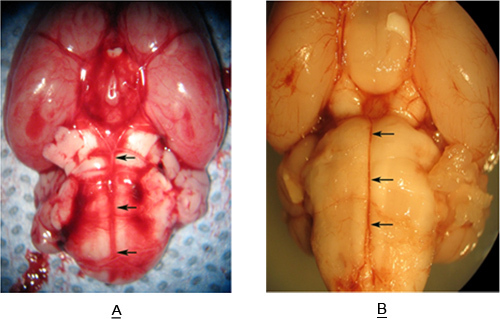 Figure-3 shows a brainstem specimen retrieved from a rat without (Figure-3A) and with (Figure-3B) subarachnoid hemorrhage. Note the collection of blood in the subarachnoid space around the basilar artery in Figure-3B. This represents a sufficient volume of blood to induce vasospasm of the basilar artery. The arrows in Figure-3A and Figure-3B define the extent of the basilar artery (BA). Sections (12 μm) are taken from the length of the BA extending from the AICA to the SCA. Twenty sections were analyzed for each basilar artery specimen in the SAH and saline control groups (Figure-4). The internal luminal cross sectional area of the basilar artery were smaller and there was significant corrugation of the internal elastic lamina suggestive of vasospasm, in the SAH group (Figure-4A). The basilar artery from the saline control group was larger in area and did not have a corrugated internal elastic lamina (Figure-4B). A quantification of the degree of reduction in area between the two groups can be found in Figure 5. These studies confirm that this SAH model does produce cerebral vasospasm that can be assessed using histological methods. Luminal cross sectional area was used to determine vasospasm because tissue processing occasionally results in amorphous cross-sections of the vessels, making it difficult to determine an appropriate diameter to measure and use for data analysis. All measurements were performed using the NIH Image-J software. 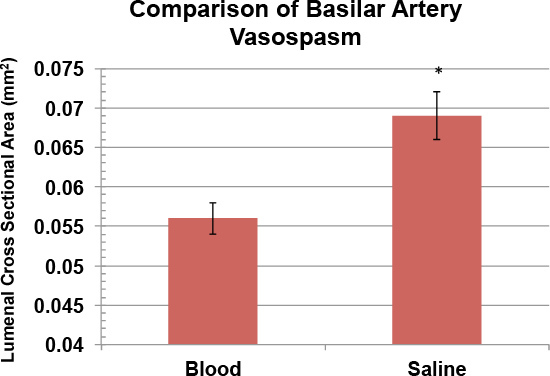 In the SAH group, the basilar artery area (internal=.056 μm ± 3) were significantly smaller than the saline control group (internal=.069 μm ± 3; p=0.004) due to vasospasm. Significance was tested using Tukey/Kramer's statistical analysis. Table 1 illustrates these values with calculated standard deviations and standard errors for both groups. Figure 1. Insertion of a 26 gauge catheter is inserted into the tail artery. Figure 2. Appearance of atlanto-occipital membrane (arrow)in the rat. Figure 3. Ventral surface of the rat brainstem an basilar artery (arrows) with (A), and without (B), SAH. Figure 4. Histological sections showing basilar artery in SAH (A) and saline control (B) groups. Note that the luminal cross sectional area of the basilar artery is smaller and the internal elastic lamina is corrugated (arrow) in the SAH group, both consistent with vasospasm. Figure 5. Comparison of Basilar Artery luminal cross sectional areas between the SAH and saline control groups. Count Mean (Luminal cross sectional area) Std. Dev. Std. Err. Table 1. Calculated means and standard deviations of SAH and salien control groups. Table 2. Summary of the published double subarachnoid hemorrhage rat models. Primates, having a more similar genetic composition and anatomical features to the human, more closely mimic the events of delayed cerebral vasospasm and can more easily undergo non-invasive imaging (MRI and angiography) to monitor arterial changes, than rodents 8. However, primate models are cost-prohibitive and associated with more complex care and ethical issues, than small animal models. Small animal SAH models that have been developed previously have focused on three methods of inducing SAH: 1) Endovascular arterial perforation of an intracranial artery allowing blood to escape into the subarachnoid space and collect around the injured artery; 2) Surgical exposure of an artery and local autologous clot injection; 3) Direct injection of blood (autologous or donor) into the subarachnoid space 8. Every model has its own merits and disadvantages. For example, the endovascular perforation model most closely mimics the events of an aneurysm rupture but is associated with a very high mortality rate and early vasospasm, while the surgical approach is artificial and does not mimic the events of the typical human presentation of aneurysmal SAH. The direct injection model that we describe here does have a lower mortality than the endovascular perforation model and more closely mimics the human SAH condition than an open surgical model. Though similar models have been described previously, we had a large learning curve with SAH model development because the potential complications from the nuances of the model, were not well described anywhere previously. It was our intent to better define these potential traps so that future investigators could more easily use this reproducible SAH model. While we propose a simple and cost effective model to study the effects of delayed vasospasm, it is not without its limitations. Due to the ability for rats to rapidly clear blood from the subarachnoid space, and the anatomical differences in the cerebral arteries themselves, rats are considered a poor model for the study of delayed subarachnoid hemorrhage 6, 8. There are a few critical steps that would affect the outcome of the model. The dose of Ketamine/Xylazine cocktail should not exceed 0.1 ml/kg to ensure adequate anesthesia. Any amount of pooling of blood after injection into the cisterna magna should be noted and documented as we have noted that pooling of blood leads to a lesser degree of vasospasm 9, 13, 15. Other studies have shown that second injections of blood 24 hr apart can induce a more significant degree of vasospasm 6, we believe it would not mimic the time course of vasospasm in humans where vasospasm rarely occurs prior to day three after SAH. In order to more closely mimic this time course we made the second injection of blood 48 hr after the first injection. Potential modifications of the model we describe include injecting larger volumes of blood into the subarachnoid space, changing the source of blood, altering the time course for the second injection, and sacrificing further out than five days after the second blood injection. Such variations in previous models can be found above in Table 2. During the course of our model development, we used both single and double injection models, altered the time between injections with the double SAH model, tested various volumes of blood, tested the effects of hemolysed blood, tried venous versus arterial and autologous versus donor blood injections. Each of these modifications lead to complications that resulted in an unusable model for testing delayed vasospasm. The model described above consistently produced a low mortality basilar artery SAH small animal model of delayed cerebral vasospasm (CV) 6, 7, 11, 13, 15. Low mortality rates allow for a more thorough understanding of the entire mechanism of cerebral vasospasm 13. Bederson et al. 1 have used the endovascular perforation model, reporting a mortality rate of 50% within 24 hr of observation. Veelken et al. 16 with their endovascular filament ICA perforation model described a mortality rate of 100% in the normal perfusion group within 3 hr of the procedure. The endovascular perforation model performed by Lee et al. 7 showed a significant degree of vasospasm (BA diameter 230 μm ± 70) compared to the double hemorrhage model within the same study (BA diameter 320 μm ± 36), and the mortality rate for the perforation model was reported to be 44%. The fivefold increase in glutamate levels, as well as increases in lactate and free fatty acid concentrations are some of the detrimental metabolic effects seen a few minutes after induction of SAH that contribute to the increased mortality in the perforation model 10.There is enough evidence to support that the perforation model needs further refinement in order to control the high mortality rates. The mortality rates using the double-SAH model vary widely depending on the volume of blood injected and the rate of injection. We found that larger volumes of blood and faster injection rates, all lead to respiratory arrest and frequently death during or immediately after the blood injection. During model development, mortality rates ranged from 1.5% to 47% with blood volume being the most important factor affecting mortality. With the perfection of the current model we describe here, we report no mortalities. There are several tools available to successfully identify and assess the degree of CV; histology, electron microscopy, angiography, and MRI 5, 6, 11, 12, 15. In our model, no attempt was made to use any other methods aside from histology. In the quest for better understanding the underlying pathophysiology of delayed CV in rat models, one can undertake a myriad of future applications as an extension of our model. The essential goal is the development of agents that could successfully prevent and treat CV in humans. In order to do so one must understand the complex interactions and multifactorial processes that initiate and sustains CV in humans 17. With the establishment of a suitable survivable SAH rat model, investigators can focus on the short and long term mechanisms of cerebral vasospasm and avoid conflicting data typical of secondary ischemic damage in the rat neurons 2, 4, 8. We believe that the SAH model described here will be a beneficial investigative tool for the understanding of the processes that initiate and sustain CV. We have nothing to disclose pertaining to this study. We would like to acknowledge the efforts of Dr Mary-Lou Vallano, Department of Neuroscience and Physiology, for her valuable inputs in the write up for this manuscript. * Synthesized at Department of Laboratory Animal Care, SUNY Upstate Medical University. Add 1 cc [100 mg/ml] of Xylazine to 10 ml [100 mg/ml] of Ketamine. Bederson, J. B., Germano, I. M., Guarino, L. Cortical blood flow and cerebral perfusion pressure in a new noncraniotomy model of subarachnoid hemorrhage in the rat. Stroke. 26, 1086-1091 (1995). Cheng, G., Wei, L., Zhi-Dan, S., Shi-Guang, Z., Xiang-Zhen, L. Atorvastatin ameliorates cerebral vasospasm and early brain injury after subarachnoid hemorrhage and inhibits caspase-dependent apoptosis pathway. BMC Neurosci. 10, 7-17 (2009). Jackowski, A., Crockard, A., Burnstock, G., Russell, R. R., Kristek, F. The time course of intracranial pathophysiological changes following experimental subarachnoid hemorrhage in the rat. J. Cereb. Blood Flow Metab. 10, 835-849 (1990). Kaoutzanis, M., Yokota, M., Sibilia, R., Peterson, J. W. Neurologic evaluation in a canine model of single and double subarachnoid hemorrhage. J. Neurosci. Methods. 50, 301-307 (1993). Karaoglan, A., Akdemir, O., Barut, S., Kokturk, S., Uzun, H., Tasyurekli, M., Colak, A. The effects of resveratrol on vasospasm after experimental subarachnoid hemorrhage in rats. Surg. Neurol. 70, 337-343 (2008). Lee, J. Y., Huang, D. L., Keep, R., Sagher, O. Characterization of an improved double hemorrhage rat model for the study of delayed cerebral vasospasm. J. Neurosci. Methods. 168, 358-366 (2008). Lee, J. Y., Sagher, O., Keep, R., Hua, Y., Xi, G. Comparison of experimental rat models of early brain injury after subarachnoid hemorrhage. Neurosurgery. 65, (2), 331-343 (2009). Megyesi, J. F., Vollrath, B., Cook, D. A., Findlay, J. M. In vivo animal models of cerebral vasospasm: a review. Neurosurgery. 46, 448-460 (2000). Prunell, G. F., Mathiesen, T., Diemer, N. H., Svendgaard, N. A. Experimental subarachnoid hemorrhage: Subarachnoid blood volume, mortality rate, neuronal death, cerebral blood flow, and perfusion pressure in three different rat models. Neurosurgery. 52, 165-176 (2003). Prunell, G. F., Mathiesen, T., Svendgaard, N. A. Experimental subarachnoid hemorrhage: Cerebral blood flow and brain metabolism during the acute phase in three different models in the rat. Neurosurgery. 54, 426-436 (2004). Ryba, M. S., Gordon-Krajcer, W., Walski, M., Chalimoniuk, M., Chrapusta, S. J. Hydroxylamine attenuates the effects of simulated subarachnoid hemorrhage: implication for the role of oxidative stress in cerebral vasospasm. Neurol. Res. 31, 195-199 (1999). Satoh, M., Parent, A. D., Zhang, J. H. Inhibitory effect with antisense mitogen-activated protein kinase oligodeoxynucleotide against cerebral vasospasm in rats. Stroke. 33, 775-781 (2002). Suzuki, H., Kanamaru, K., Tsunoda, H., Inada, H., Kuroki, M., Sun, H., Waga, S., Tanaka, T. Heme oxygenase-1 gene induction as an intrinsic regulation against delayed cerebral vasospasm in rats. J. Clin. Invest. 104, 59-66 (1999). Swift, D. M., Solomon, R. A. Subarachnoid hemorrhage fails to produce vasculopathy or chronic blood flow changes in rats. Stroke. 19, 878-882 (1988). Vatter, H., Weidauer, S., Konczalla, J., Dettmann, E., Zimmermann, M., Raabe, A., Preibisch, C., Zanella, F., Seifert, V. Time course in the development of cerebral vasospasm after experimental subarachnoid hemorrhage: clinical and neuroradiological assessment of the rat double hemorrhage model. Neurosurgery. 58, 1190-1197 (2006). Veelken, J. A., Laing, R. J., Jakubowski, J. The Sheffield model of subarachnoid hemorrhage in rats. Stroke. 26, 1279-1283 (1995). Zubkov, A. Y., Nanda, A., Zhang, J. H. Signal transduction pathways in cerebral vasospasm. Pathophysiology. 9, 47-61 (2003). Many thanks for the visual experiment. It's really useful to me. Recently, I conducted a SAH by means of double-injection method follow the protocol except anesthesia done with 10% chloral hydrate. Rats began to die 48h after the 1st blood injection. The survival suffered from diarrhea and abdominal distension. I'm not sure if 10% chloral hydrate should account for it. Any one could give me some advice for the death and symptoms.